amantha Tibbetts, 5, wears a pink T shirt with a lady on it carrying a sparkly purse. She squirms in her chair. Tibbetts, with big blue eyes and long blonde hair, is sitting in a classroom. But it's a classroom whose walls are cinder block, and her teacher, Paul, has a rifle cradled in his lap. Paul asks the nine kids, ages 5 to 16, to name the parts of the gun. "Can you say 'trigger'?" They can. But they'd rather pull one. These kids are at Front Sight Firearms Training Institute near Las Vegas--one of several family-friendly firing ranges springing up around the U.S. Kids learn nomenclature and safety while Mom and Dad take higher caliber instruction--"Handgun Combat Master," for example, or "Uzi Submachine Gun at Night." Tibbetts, impatient, raises her small hand. "Can we shoot now?" Two other girls, Bethany LaBarge, 10, and Emma Stapleton, 8, are using felt-tip markers to draw shamrocks and hearts on their Styrofoam cups. They have a right to be bored. They already know the material. During class LaBarge explained the difference between a shotgun and rifle. Their families have come here on vacation five times in three years. As for the Tibbetts family, they switch annually between Disneyland and Front Sight. "It's hard to say which we like more," says Wayne Tibbetts, 49, a CPA and partner in a Mesa, Arizona tax firm. Five years ago Front Sight saw little such business. 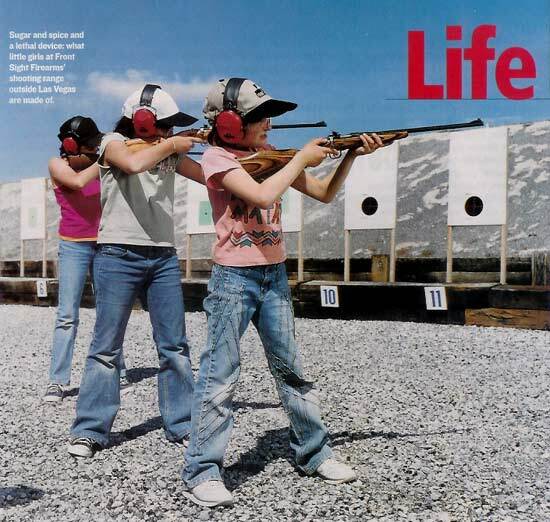 Now 15% of the 10,000 shooters it trains each year are vacationing families. Programs run by Glock and Smith & Wesson report similar upticks. Andrew Massimilian of Manhattan Shooting Excursions caters to affluent New Yorkers who want to shoot without having to go through the bother of getting permits. He transports them and their kids to ranges in New Jersey, Pennsylvania or Connecticut. Says Massimilian, "I am seeing more families who want to lock and load for the thrill of it." State legislatures, meantime, have made that thrill more attainable. Ohio and Minnesota are the latest to pass laws permitting citizens to carry concealed weapons. Today 38 states issue "concealed carry" permits, up from 14 in 1990. "Usually men come first. Then they come back and bring their wife and kids," says Front Sight founder Ignatius Piazza, a former chiropractor. Wayne Tibbetts first came in 2004 with his daughter Tracy, 19. The rest of the family soon followed. This weekend in April he's attending with his wife, Kathleen, 43, daughters Tracy and Samantha, his brother George, and his mother-in-law, Janet Grimaldi. "9/11 brought home our deep concerns for security," says Kathy. "We wanted our kids to be able to protect themselves. I want Samantha to have 'stranger-danger' awareness. Of course, she's also having a good time." Front Sight teaches kids to "trust their feelings" around "tricky" people. It also preaches firearms safety. Children memorize what they must do when and if they encounter a gun:"Stop. Don't touch. Leave the area and tell an adult." On the firing range, under an unforgiving sun, Samantha presses up against her cheek the stock of a Chipmunk 22 by Rogue Rifle Co. She shoots at a square paper target. Older kids fire submachine guns, shotguns or handguns. James Minner, 14, was visiting Front Sight with his sister Sheila, 17, and parents, Gary and Sherry Minner of Delavan, Illinois. Shooting instructor Charlene, an off-duty Las Vegas cop, takes down Samantha's target. Most of the 5-year-old's shots have found home. Samantha, clutching her paper, runs to show her mother. "Daddy will be so pleased," says Kathy Tibbetts, hugging her daughter. She and Wayne have themselves been busy:she in a defensive handgun program, he in a four-day rifle course. "It's hard to express how much Front Sight means to us," says Wayne. "We come away with a real sense of accomplishment." Tracy, her red hair done up in a ponytail, says that what she likes best about a shooting vacation is that she gets "good Daddy-time." "When he says, 'Good job, Trace,' I'm euphoric."